What's The Bottom Line For Increased Value... Based Only On The Facts? Some people obtain Morgan Dollars without concern for price advancements in the years ahead. These are collectors in the purest sense and are the bedrock foundation of the hobby. However, many of us try to select "Blue Chip" dates destined to rise strongly in value in the years ahead. We think about the importance of reselling someday, or passing along valuable heirlooms to family or a favorite charity. How Do I Make Sure I Buy Morgan Dollars That Go Up In Value? What are the "Blue Chip" Morgan Dollars? That's the question many collectors struggle with but never confidently answer because they lack the knowledge. Of all the dates, conditions and prices, which are the factors that are causing the coin to rise in value faster than all the others? Without the right knowledge, Morgan Dollar buyers saddle themselves with coins having poor advancement potential. They discover this years after the fact, usually when they try to sell. They could have done better had they used a dart board to choose their purchases. I even made this same mistake myself when I was younger and greener, even though I thought I knew a lot about coins. To make matters worse, I placed much of my trust in the hands of telemarketer con men who sold me overgraded, overpriced coins. Thankfully, I learned from my mistakes, and now I understand the difference between a great coin and one that's a waste of time and money. The Trend Report For Morgan Dollar Values is the result of this hard-earned knowledge. It's chocked full of historical silver dollar prices and analyses. It also has my personal guarantee. If you don't find it helpful you can get your full purchase price returned with no questions asked. And it's only $9.95. Take advantage of what I've learned from my mistakes. "It [the report] is of great value and refer to it often. It was more than I expected. I really enjoy the marketability/interest in the particular coin [Morgan Dollars]. Thanks." "The report is easy to read, nicely detailed and highlights value extremely well. I look forward to your next reports." From now on, you can base your Morgan Dollar purchase decisions on factual evidence of past performance and confidently know which coins will grow in value. "The coins that have been the most eagerly pursued by the collector base for many years, as evidenced by relatively high percentage price gains over time, will remain the "hot" coins in the years ahead. These are the elusive "Blue Chips" and are coveted by generations of collectors, past, present, and future." Understanding long term silver dollar coin values and trends while comparing percentage increases over various time intervals for individual dates and conditions is the scientific approach to picking "Blue Chip" Morgan Dollars. These "Blue Chips" are sure to attract plenty of attention from buyers, both collectors and investors. This is main objective of the Trend Report for Morgan Dollar Values. Who Compiled the Trend Report For Morgan Dollar Values? My name is Daniel J. Goevert. I've been a devoted coin collector for more than 50 years. Instead of watching "My Three Sons" on TV like many kids my age, I'd be at the kitchen table with my Big Chief tablet, #2 pencil, and a slide ruler, charting out collectible coin pricing data. Back in 1987, I started publishng coin value trend data and analyzing percentage gains and losses for United States coins. I've been at it ever since. That's me on the right. Might be time for an updated photo, LOL. In 2003, I started this website, for the purpose of sharing my research with a wider audience. Since then, I've posted tons of trend data on this site. I invite you to review the online reports here to get a good flavor for what this Trend Report For Morgan Dollar Values has to offer. It contains a bonus feature called the Collector Index. More on this shortly. Clear and concise tables show approximate retail prices at various intervals since 1950 for all Morgan Silver Dollars. There is a table for each individual date. Values are recorded as they were published in the years 1950, 1955, 1960, 1965, 1970, 1975, 1980, 1985, 1990, 1995, 2000, 2002, 2005, 2007, 2009, 2011, 2013, 2015, 2017, and 2019. Conditions F-12 to MS-67 are listed, as well as PF-65, where applicable. In addition, DMPL (Deep Mirror Proof Like), a quality followed avidly by today's serious numismatists, is included. In order to facilitate comparisons from coin to coin, annualized return rate percentages from certain years in the past to the present are computed. Morgan Dollars with the highest percentages should interest you the most, if long term value appreciation is what you have in mind! Not everybody is crazy about fixating on percentages, so we developed a feature called the Collector Index. The idea of the index is to help the coin collector interpret the data tables faster by assigning a color coded score to every date across the full grade spectrum. A high score indicates the coin has a reputation for attracting keen attention within the numismatic community, translating to good potential for solid future value growth; a low score means to expect a comparatively sluggish performance in the coin price guide. Keep reading to learn even more about the Collector Index. What Do the Coin Value Tables Look Like? Grade: This row indicates coin grade, based on the ANA scale. Example: AU-50 stands for Almost Uncirculate with a 50 point grade. Value: The example circled indicates this coin was worth $550.00 in VF-20 condition in the year 2000. Return Rate %: Show the effective percentage annual return rate, from the year in the far left column to the present. The example circles indicates this coin in XF-40 condition lost at a rate of -3.68% annually from 2009 to 2019. The same coin grew at an annual rate of 9.58% from 1950 to 2019 (note: everthing has been updated for 2019). If you've managed to read this far down the page, you'll be happy to know you're almost to the end. Now that you understand how to benefit from the Coin Value Tables, we're now ready to have a closer look at the Collector Index. The Collector Index is found in the bottom row of every Coin Value Table. It estimates the potential value growth for the highlighted coin in a range of conditions. Current price range. Coins with bigger price tags have a better chance of earning a good Index score compared to lesser coins. Why is this? Consider a coin that doubles in value from 25.00 to $50.00 over a five year period; in effect, this coin compounded annually at a rate of 14.67% over the five years. Nice, but who gets excited about a gain of "only" $25.00? On the other hand, a coin that doubles from $250 to $500 over the same time is something to get jazzed about! It is exactly what I expected and wanted. I had downloaded the free data without the [Collector Index] grades, but really wanted the accompanying [Index] grades, so I took the leap. I'm very happy. Thank you." Keep the report on your desk for quick reference or take it to coin shows. "I recently decided to invest in some Morgan dollars so I sought out the best possible information I could to help me make the most informed buying decisions. 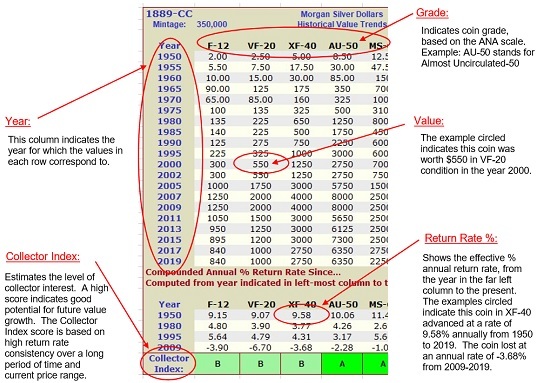 The Morgan Dollar Value Trend Report is easy and fun to read, and the Collector Index is a huge key to understanding which coins have the best possible future value increase. It was the smartest and easiest decision I could have made in researching Morgan dollars for investment." Joe Roderick from Vancouver, B.C. 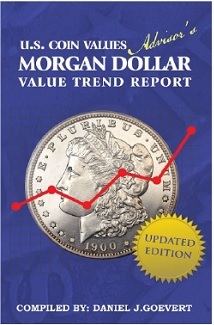 The Trend Report for Morgan Dollar Values is an easy download. Seconds later, you'll receive an email with an E-Junkie link to download the 41 page Trend Report For Morgan Dollar Values. Every purchase of the report is highly appreciated, and is helpful in keeping this website going! I'm confident you will be happy with this report. However, if it does not meet your expectations, I offer an unconditional, no-questions-asked, full refund. In the 10 years I've been producing this report, there has been only one request for a refund, and even he said the report was good, just not what he was expecting. P.S. Take advantage of my years of experience and learn the secrets of making money with Morgan dollars.